State Bank of India offering many offers to State Government Employees when they have salary accounts with them. Download Request Letter or Application Form to convert your saving accounta as Salary Account if you are an Employee in State Govt of Telangana/Andhra Pradesh. Teachers and Employees may have many concessions if they convert their Bank Accounts as Salary Accounts at Rate of interests, ATM Transactions, Loans Insurances and many more. SBI State Govt Employees Salary Account Benefits. 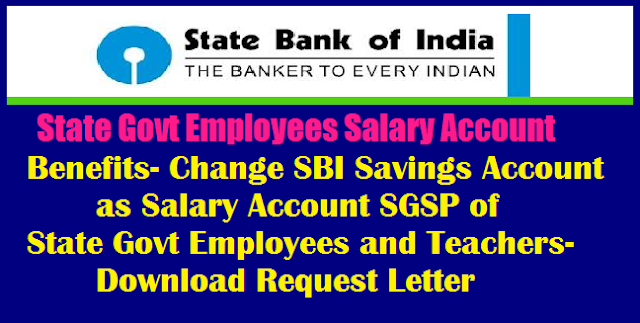 State Bank of India benefits for State Government Salary Package Accounts. SGSP also known as SALARY ACCOUNTS UNDER STATE GOVERNMENT SALARY PACKAGE (SGSP). Salary Accounts under SGSP a gamut of privileges and other value added services to the employees of State Government, Union Territories and their Boards/Corporations. Salary Accounts under this package are available in four variants, namely Silver, Gold, Diamond and Platinum depending on the designation of the personnel. Write an application to change your account type to respective salary account with proof of your job (e.g. Salary Slip, Service Certificate etc). This process holds true if you are working at Central Government or State Government or PSU.The request for conversion of normal saving Bank account to salary account cannot be submitted by you directly to the branch. Submit it through your DDO.